A considerable number Windows users, spend much of their time in managing documents, files and folders, mainly for backing up, transferring or emailing. Like many of them, you too may be aware of many of those shortcomings of Windows File Management which the Operating System could throw on you anytime. Then there is nothing you can do but bite the bullet and start all over again. Some of the Applications mentioned here may be applicable to the users of Windows XP only. I am hopeful that they will work for all users with Windows NT Operating Systems (Windows 2000 and above). This article is mainly aimed at improving your productivity while managing files using the Graphical User Interface of Windows, known as the Windows Explorer. Keyboard Shortcut keys do remain the primary way of browsing Windows faster than the mouse but I am not going to write about the same old stuff which you see in plenty of places, dictating the use of Windows shortcut key combinations for accomplishing common tasks. I have always appreciated "Freeware" which comes bundled without "Spyware / Adware / Malware" and my recommendations come in only after I have tried my hand extensively at each one. Like all other users, I am also a big fan of software that is compact, lightweight and has a small download size. A small download size helps ensure that it will be less buggy and will at least do the work that it has been advertized to do, if nothing more than that. 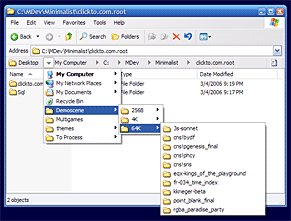 Below is a list of some applications which I did find complementing Windows Explorer hand in hand. How many times have you tried to copy / move a folder with many sub folders that has hundreds of files only to find Windows spit on your face; by doing only part of the job just because one of the mix was corrupt or was in use. Windows simply drops the job, leaving it in an incomplete messy state, where you never know if a folder was even copied completely. It was back in the old days of Windows 98 when I had a CD, a copy of which I wanted to place on my Hard Drive for faster installation. The Copy never made it, owing to some spot on the CD that was damaged to an unreadable extent. Of course, I managed to get it done but with multiple instances of copy and paste which we are going to avoid from now on. Download Teracopy from http://www.codesector.com/teracopy.php This tool when installed does your job on the fly much smartly than Windows, prompting you to rename Files when it finds duplicates and ignoring / skipping Files that may be corrupt or in use. You can copy gigabytes of Data without worries. It integrates very well within Windows and there is very little interaction needed from your side unless a situation specifically arises for it. Moreover you can Pause and Resume your Transfers. The Copy Dialog changes to a neat Progressive Bar revealing more granular details of the Job in progress. Teracopy is constantly being recommended by experts here at Experts Exchange and honestly this is the place where I learned about it. It may be the last of all things which I came across but makes to the top of my list in this article. It is a simple Graphical User Interface that helps you to keep Folders in Sync with a greater level of comfort. Management is basically done by looking at the hierarchy of the Files placed in the Folders. So if you move a File to a different Folder, the Application will consider it as a deletion from one and an addition to the other. I guess the software is not smart here, but that's the way it works. Once the Analysis is complete, it will provide you with a list of Files present in both Folders that are out of sync. You can choose to copy them over to the other folder where they are not present or delete them from the current folder, ultimately making the stuff on both the folders identical (or in sync). It may be questioned -- why not delete and start all over? No, time saved in Analysis is much less and what if you want to work with Gigabyte sized Folders that have only a few files changed. You don't want to waste that much time, right. What about an X number of files present in Master Folder and a Y number of different files which are also present in the Copy Folder at the same time? A Delete and start over would mess it all up! What about those files which you decide to delete from the Master folder which remain in the Copy Folder? During sync, you get those files identified in the Copy Folder, which you can delete then, thus placing them back in sync again, saving space, time and nerves. I tried the Briefcase feature of Microsoft but found it to be very complicated to accomplish what I wanted. If anybody has had success with it, please comment and educate me. Almost everyone, including me is a big fan of the multiple tabs feature of Firefox, Opera, Google Chrome and yes, Internet Explorer too (albeit a bit late). Tabs help us to keep things organized; increase the taskbar real estate by allowing us to open many instances of a browser window in one place; effectively grouping it all up. I too wondered about having such a feature in Windows Explorer which would ease things a lot, until I found the QTTabBar. Just in case it doesn't appear in Windows Explorer after an install, don't panic. Right Click anywhere in an empty space of the Toolbar area where you have the Back and Forward Buttons, uncheck "Lock the Toolbars" and see if you can find a toolbar relating to it stuck far right. Pull it into view. One could argue, you have the "Group similar Taskbar Buttons" option and you can Open up Windows, cascade or tile them horizontally / vertically! I agree with that but you can do the same with your web browsers too, then why are you using tabs in them? With the introduction of Vista, XP users sulked at the thought of not having the dropdown interface which is there at the address bar of Explorer. I too wished to have all the goodies of Windows Vista without actually paying for. Who wants to? Microsoft has always been targeted at everything, whether it builds something beautiful or something ugly. Do you remember that Paper Clip (Help Assistant) of the earlier Windows Office versions? I personally had a great liking for it but found everyone wanting to just kill it. We are not talking about that Paper Clip here but of the Puppy search assistant which comes up when you decide to fire up a search within Windows. Windows search is great but I find that it takes a lot of time. How about trying out a new tool? 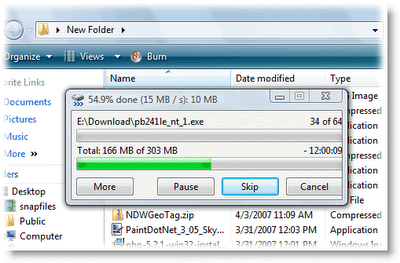 Download locate32 from http://locate32.net/content/view/18/31/ I believe it searches much faster than the Windows Puppy. This application is also one of those which I see being recommended by experts here at Experts Exchange every now and then. You can see Screenshots of the Application at http://locate32.net/content/view/149/52/ So I have not posted any images here. Of course, there is also the Google Desktop Search which could be better. Since I have not tried it, I am unable to promote it here. I always believe in using titles with catchy lines that probably made you finally reaching down this far. Of course, the quality of posted content matters too. Was the read worth it? It is a humble request that you download at least one of the above mentioned applications and play with it. Now like all other writers, may I request that you the reader to kindly click the Small Blue "Yes" button at the End of this Article, where it states "Was this article helpful? ", if you really did find it helpful. A "No" is also welcome, so that at least I will know that you got through the stuff I wrote.